If you take the time to sit through the opening scenes for this new online slot from Net Entertainment then you’ll know you’re onto a good thing; it’s an action packed, slow motion, mini-movie which may even bear more than one viewing. Robin Hood Shifting Riches is of course based on the legend of that eponymous character and his band of merry men and the story is in safe hands here. This is a five reel and twenty payline game which takes place against a backdrop of Sherwood Forest in autumn and it’s accompanied by a suitably medieval soundtrack. The basic symbols are represented by embroidered playing cards while the higher value ones are all related to the theme. So we have a Knight in armour, Friar Tuck, Little John, Maid Marion and Robin himself. 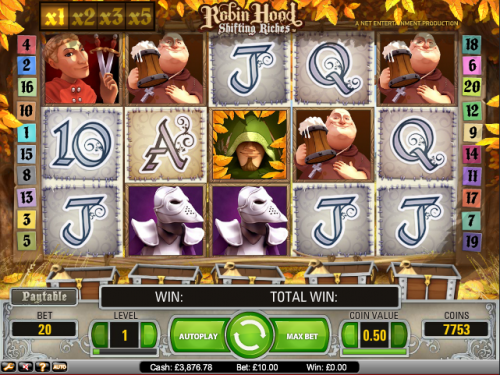 Special symbols include a Robin Hood wild logo, a money bag and a Free Spins symbol. Net Entertainment are masters at building extra features into the standard game; in this slot when you land a winning combo, reel five will slide off to the right and another reel will barge it’s way in on the left. Land a second win with the new arrangement and it will be subject to a 2x multiplier, another will be 3x and one more will be the maximum of 5x. Fail to land a win and the multiplier returns to 1x. Getting to the free spins bonus game can be a time-consuming affair because what you need to do is collect four money bags in one of the five chests below the reels; don’t expect to collect these bags in one sitting but you don’t need to because the game will remember your progress for a whole year – come back to it and the bags you’ve collected so far will be there. During the free spins round one of the characters will become wild and more spins can be won by landing 2 or more free spins symbols. This is yet another inventive and ridiculously addictive slot from Net Entertainment; the difficulty of getting to the free spins bonus game might seem counter-productive but it will make sure you keep coming back to this game.